Carefully selected foraging toys which will provide safe, healthy enrichment. Foraging for beginners to advanced! 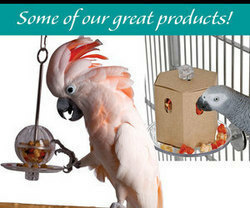 Your parrot will live in a more fully enriched environment. Your pets self confidence will grow as it recognizes its ability to achieve objectives. More time allocated to foraging equates to having less time available for less desirable activities such as excessive screeching, feather picking, etc. Veterinarians agree that food foraging is a necessary, healthy behavior which will positively impact your pets psychological and physical wellness. Replacement cones. Great to have on hand for easy refills!